A regular sightseeing cruise service departing from Senzaki Port (Nagato City, Yamaguchi Prefecture) circling around Omijima, known as the “Alps of the Sea,” in around 80 minutes. 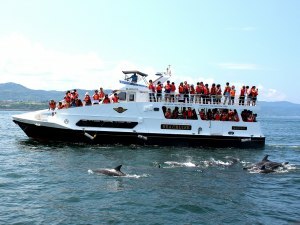 The Amakusa Dolphin Watching Line is a regularly operated cruise operating out of Maejima (Matsushima) Port (Kamiamakusa city, Kumamoto Prefecture). 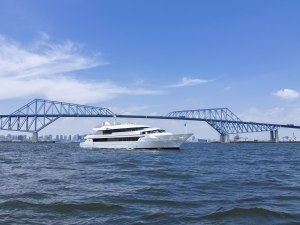 Two routes are available: A 2-hour dolphin watching tour in the Ariake Sea, and a 30-minute tour of the Amakusa Matsushima archipelago and the famous Five Bridges of Amakusa. A sightseeing cruise ship with dining that departs from Tennoz Isle (Shinagawa, Tokyo) and cruises around Tokyo Bay for 1-2 hours. The dining cruise ship named "Lady Crystal" has a capacity of 190 passengers. The view from aboard the ship is magnificent, especially the view from the deck. A regular sightseeing line which makes a tour around Shimizu Port (Shimizu-ku, Shizuoka-shi, Shizuoka-ken) in approximately 45 minutes. 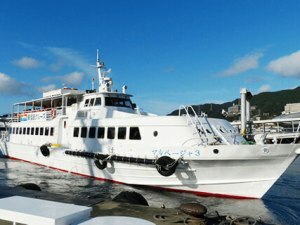 A one hour long regular excursion ferry for tourists that circles around the Nagasaki Bay from Nagasaki Port (Nagasaki City, Nagasaki Prefecture). A high speed ferry that connects Nagasaki Port (Nagasaki City of Nagasaki Prefecture) to World Heritage Site Hashima Island. Ths ferry arrives at Hashima Island, also known as Gunkanjima, where passengers take time to explore the island and then return to Nagasaki Port. This regular ferry takes about 2 hours and 30 minutes for the whole route. 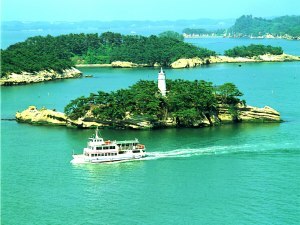 An irregular sight-seeing cruise service that starts from Matsushima Port(Matsushima tourism pier) and cruises around Matsushima Bay (Miyagi Prefecture, Miyagi District, Matsushima City) . A 50 minute cruise ride. 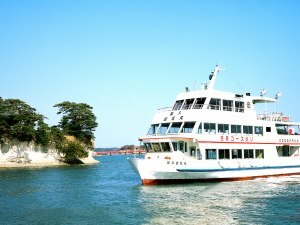 A regular sight-seeing cruise service that connects Shiogama Port (Miyagi Prefecture, Shiogama City) and Matsushima Port (Miyagi Prefecture, Miyagi District, Matsushima City) . A 50 minute cruise ride. A regular sightseeing line departing from Naruto Park (Kameura Fishing Port) (Naruto-shi, Tokushima-ken), which cruises around whirlpools of Naruto by a high speed passenger ship for about 20 minutes. 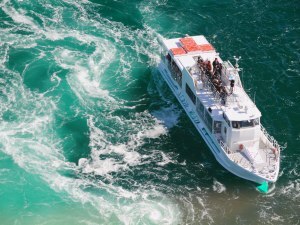 An irregular tourist cruise line that tours the Naruto whirlpools. The 30 minute cruise ride begins at the Naruto Park (Kameura Tourist Port) (Tokushima Prefecture, Naruto City). 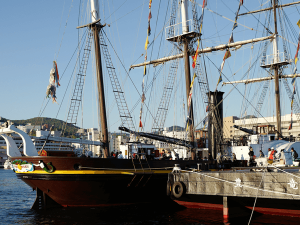 Two ships, large and small, are in operation, with the large ship having a capacity of 395 passengers. The whirlpools can be observed from the upper deck of the ship.